Company Overview - Hangzhou Aihua Instruments Co., Ltd.
Hangzhou Aihua Instruments Co., Ltd.
11YRSHangzhou Aihua Instruments Co., Ltd.
Hangzhou Aihua Instruments Co., Ltd is a high-tech enterprise in the high-new technology industrial development zone of Hangzhou and specialize in acoustic and vibration measuring instruments production and development. 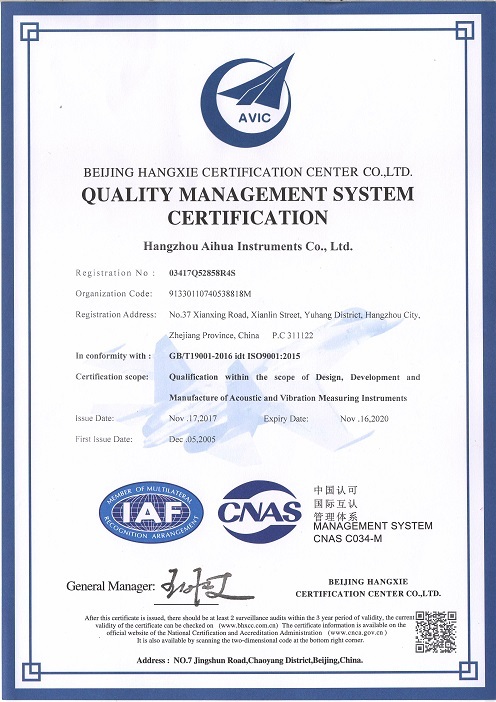 The company is the main researcher and manufacturer of sound measuring instruments in China. 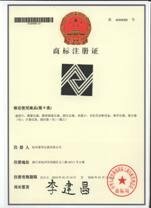 Based on many years' reseach and innovation, we produce products complying with relevant national standards and international standards, and tested by the provincial authoritative organization. Sound level meters complied with the new standards IEC61672.1-2002. Our company produces more 60 varieties of measuring instruments on noise, acoustic, vibration and environmental noise automatic monitoring system, covering ambient noise measuring, industrial noise measuring, noise measures at the airport, architectural acoustics measuring, electric acoustic measuring, machine vibration measure, environmental vibration measure, frequency spectra analysis on noise and vibration etc. We now take the lead in China in digital detect technique, burst noise data deleted scientifically, digital filter, automatic spectra analysis, re-control and re-monitoring etc. Our products are well received by consumers from all across the country and export to America, South America, Europ and Southeast Asia. AWA's sound lever meters have been leading brand products known to the whole acoustic field. To serve users better, we set up local offices in most main cites in China and also many abroad such as Signapore, Germany, Peru and so on. It is believed that you will be satisfied with our products and service. 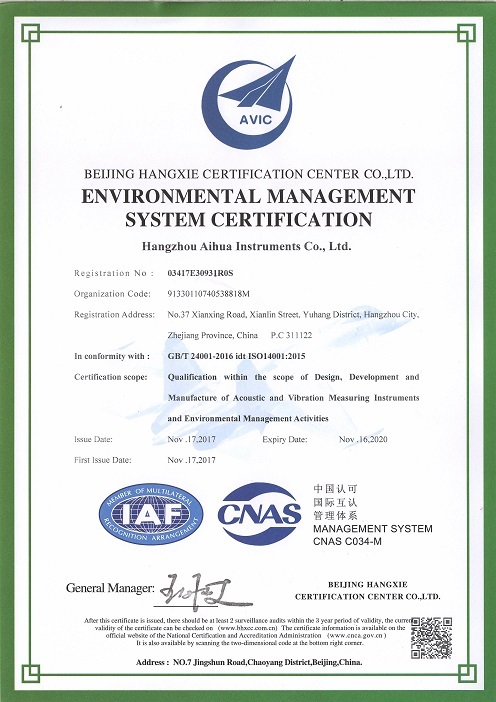 BEIJIN HANGXIE CERTIFICATION CENTER CO., LTD.